An artist closely associated with the Heidelberg School, Charles Conder was an English-born painter, lithographer and designer. Charles Edward Conder (24 October 1868 – 9 February 1909) was an English-born painter, lithographer and designer. He emigrated to Australia and was a key figure in the Heidelberg School, arguably the beginning of a distinctively Australian tradition in Western art. An artist closely associated with the Heidelberg School, Charles Conder was sent from London to Sydney to work as a surveyor in 1884. After spending two years surveying the country, he resumed his art study (at night) and joined the staff of the Illustrated Sydney News. It was in the summer of 1887-88 that he first met Tom Roberts and Giralamo Nerli in Sydney. He had previously painted in the Hawkesbury district with Julian Ashton and others and, shortly after, moved to Melbourne, joined the Box Hill Camp with the Heidelberg School artists Roberts, Streeton and McCubbin, attending evening classes at the National Gallery School under McCubbin. The next two summers (1888-90) he spent with the group at Eaglemont, in the meantime co-organising and designing the catalogue covers for their ‘9 by 5 Impression Exhibition’ in Melbourne. Conder sailed for Europe in 1890 and, after achieving success in Paris (his work was praised by Degas and Pissarro), moved to London and joined the New English Art Club. 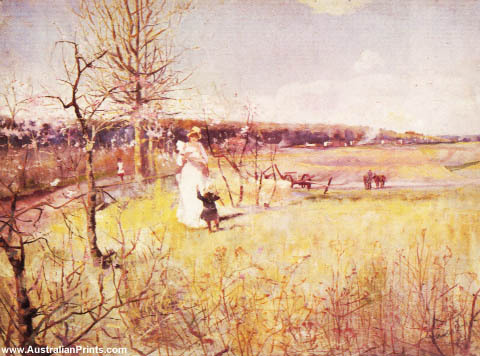 Artist information page for Charles Conder. This article uses material from the Wikipedia article Charles Conder, which is released under the Creative Commons Attribution-Share-Alike License 3.0.